Sparse background information to provide on this social media find – but it’s a couple of death metal fan boys from Seattle, Washington who decide to flesh out their sound with a bit of thrash energy at times for this Hell on Earth EP. Andy Shea handles the bass and rhythm/lead guitar duties, while Brady Johnson is on vocals – and the drumming/production work takes shape through Chris Mannino. Considering the small sample size for Resistor at three proper songs plus a short “Descent A.D.” instrumental to end things, you’ll find these gentlemen are at a feeling out stage in terms of direction and songwriting – but possess promise in spurts to warrant attention for sure. Andy for instance knows when to inject that twin harmony guitar aspect or flesh things out with more of a cultural spirit as a point/counterpoint offering – both of which come up in spades during “Death from Above”, a track that may make many recall the class of Metallica and a bit of that early In Flames catchiness. The faster “Present Repeats the Past” embraces more of their thrash side, although some of the transitions have a bit of that folk/epic texture that Amon Amarth followers dig – Brady capable of roaring through the speedy verses while being raspy and measured during the slower sections. 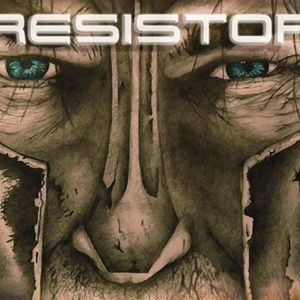 Where some may not be thrilled with Resistor comes into play in the drum department – the title track has that ‘robotic’ or stiff feel during the main verses, coming off a touch programmed and not as lively as one would expect in the thrash/melodic death metal realm. Possibly their initial foray into the recording world, this scribe is certain that with more seasoning, energy, and finances – the follow up could be that much stronger, along with incorporating a full-time drummer. At 13 minutes and change plus at an ideal name your price point from Bandcamp, Hell on Earth gives Resistor a decent starting point to develop from – and the listener a quick listening experience.